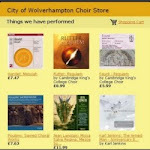 City of Wolverhampton Choir: Saturday 1 April 2017 at 7.30 - our Spring Concert! Saturday 1 April 2017 at 7.30 - our Spring Concert! Everyone agrees that Mozart's dramatic Requiem puts great demands on musicians, particularly an accompanist. So we are delighted that for our forthcoming double bill of the Mozart and Faure Requiems, we have Anthony Pinel, organist with St Chad's, Shrewsbury, with us. We also have a line-up of young professional soloists. In line with our policy of making our music as accessible and family-friendly as we can, we are continuing to offer free admission to children and young people under 18. Do come along and enjoy this evening of musical colours and contrasts, full of light and shade. Click here to get your tickets in advance.